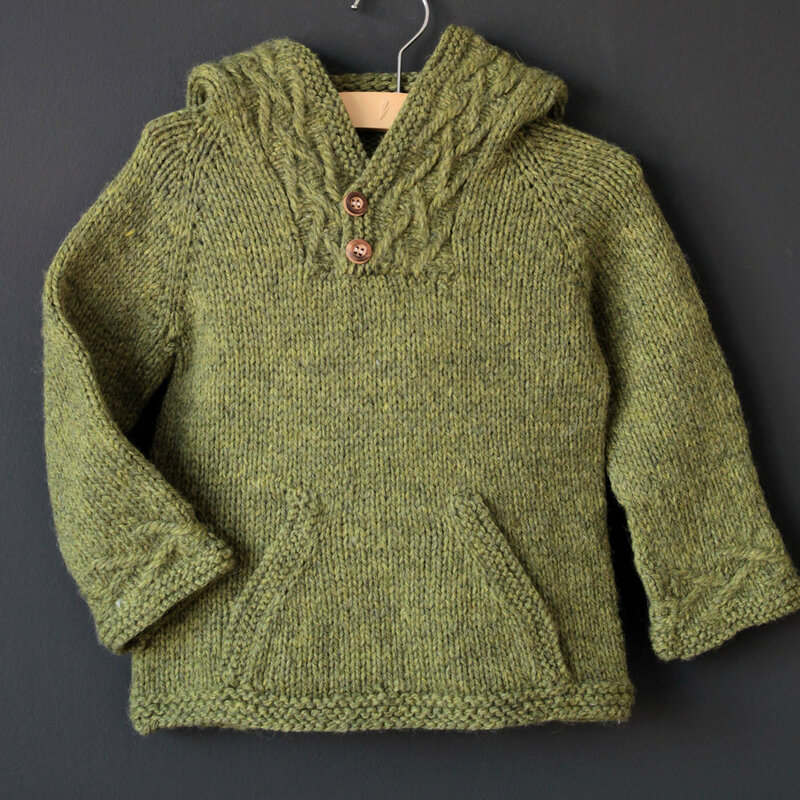 Skills required: long-tail cast-on, knitting, purling, knitting in the round, increasing, decreasing, knitting on dpns, picking up stitches, yarn over, working a stranded stitch pattern. 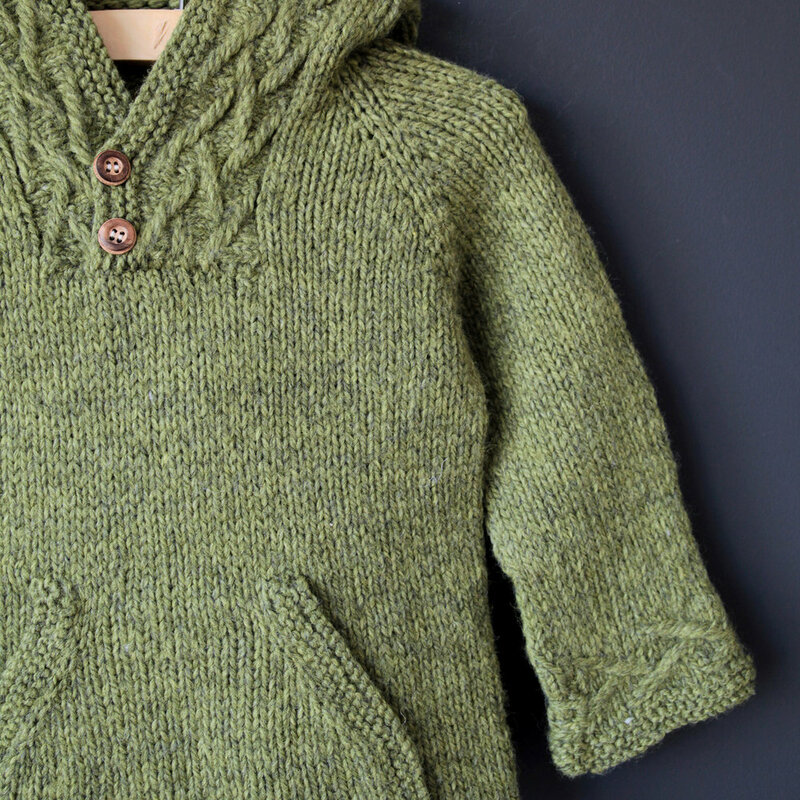 Construction: This sweater is knit mostly seamlessly from the top down, with just one seam at the top of the hood (a seamless hood solution is suggested). First it is worked flat, then stitches for the neck placket are cast on and the sweater is then worked in the round. The sleeves are worked in the round. Stitches are picked up along the hood to work the jacquard stitch band, which is then overlapped at the chest level and sewn onto the body. An optional kangaroo pocket can be added. For all little outdoorsy explorers! 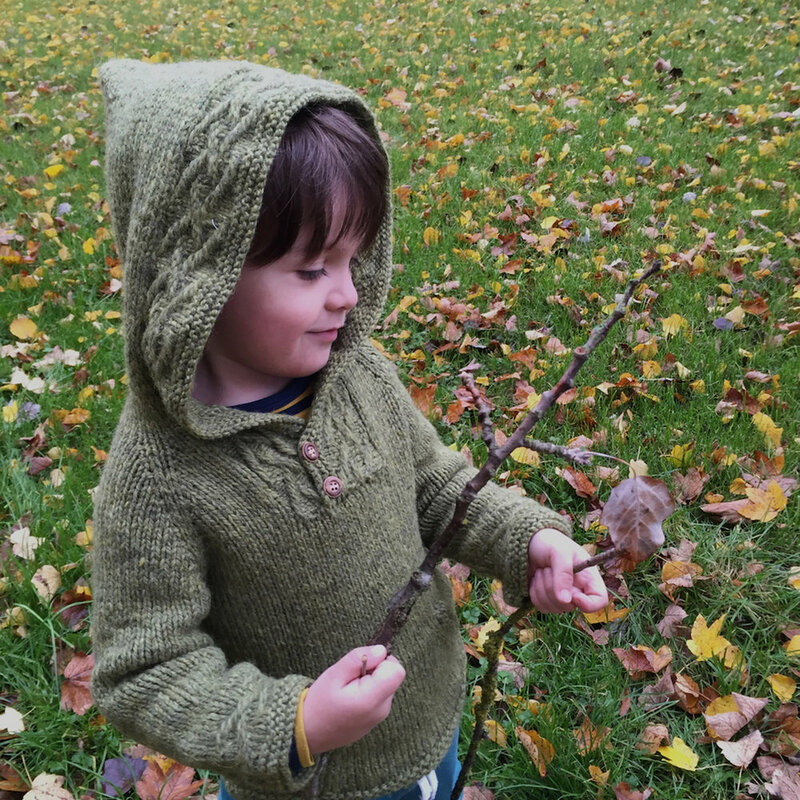 This cozy, comfy hoodie is just what’s needed to stay warm while playing, and to haul little treasures thanks to the (optional) kangaroo pocket! 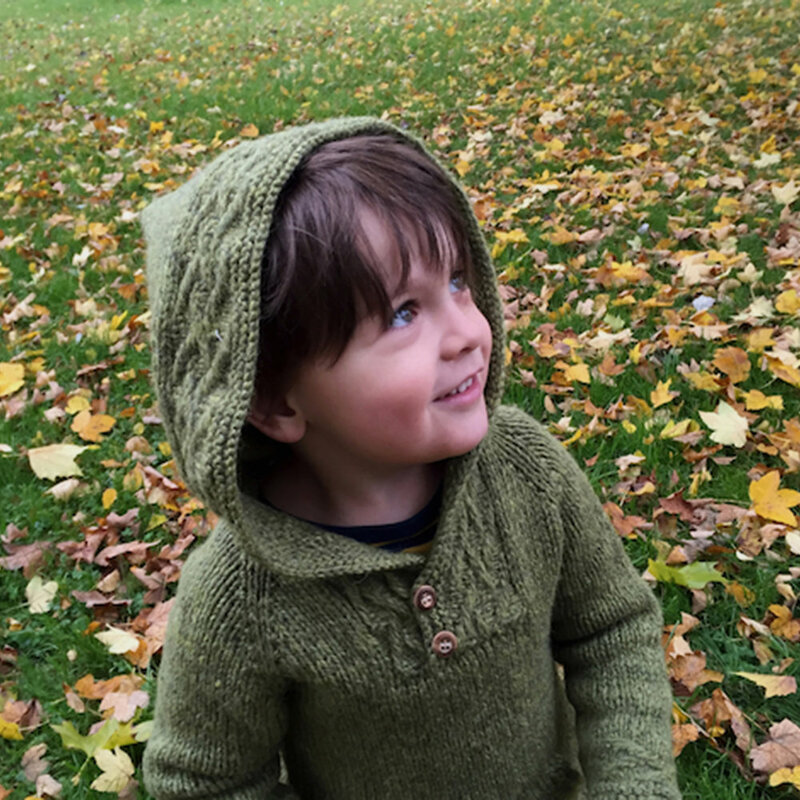 This hoodie is a very quick and easy knit, the beautiful stitch pattern is very simple, with a stunning result. Garment chest at underarms: 19 (20, 22, 23 // 25, 27, 28, 30) inches or 48.5 (51, 56, 58.5 // 63.5, 68.5, 71, 76) cm. Approximately 300 (350, 400, 450 // 500, 550, 600, 750) yds or 274 (320, 366, 411 // 457, 503, 549, 686) meters of Cascade Eco+ 100% wool ; 478yd/437m per 250g/8.82oz skein or similar aran weight yarn. 16 sts x 22 rows = 4 inches or 10cm in stockinette stitch after blocking using size A needles. 20 sts x 36 rows = 4 inches or 10cm in jacquard stitch after blocking using size B needles. 20 sts x 32 rows = 4 inches or 10cm in garter stitch after blocking using size C needles. Size A: US 10 or 6 mm circular needle (or size needed to match stockinette stitch gauge) Note: length of circular needle should be 16 inches or 40cm for Sizes 3mo to 18mo and 24 inches or 60cm for all other sizes.